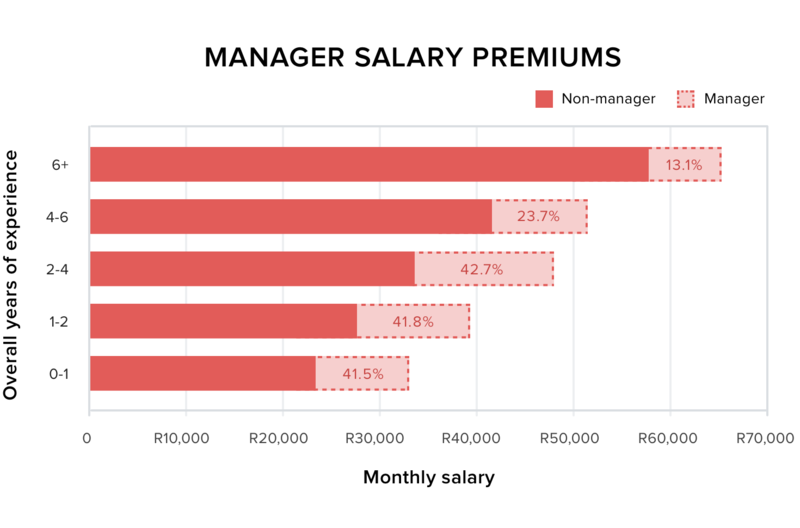 After releasing an analysis of developer salary differences between Cape Town and Johannesburg, we continued our analysis with the impact of managerial experience on a developer’s salary. When a user creates a profile on OfferZen, they are required to list previous roles and years of experience in each role. We use this data to match them with a company that will best utilise and reward them for their expertise. One of the role options a user can select is “Managerial Experience”. We combined this with the salary data we get during a user’s job interview process and got the following. Managers can have a larger influence on overall company output over other developers. It should thus not be a surprise that developers with managerial experience earn a salary premium over those without. Our data indicates that companies will offer up to 60% more for candidates that have been managers before. This highlights the impact a manager can have on the performance and culture of a team and how much companies are willing to pay for the correct leader. What is more interesting, however, is the rate at which a developer’s salary changes as their managerial experience increases. As expected, for every year that a developer specialises in a specific role, their salary will increase by approximately 10%. 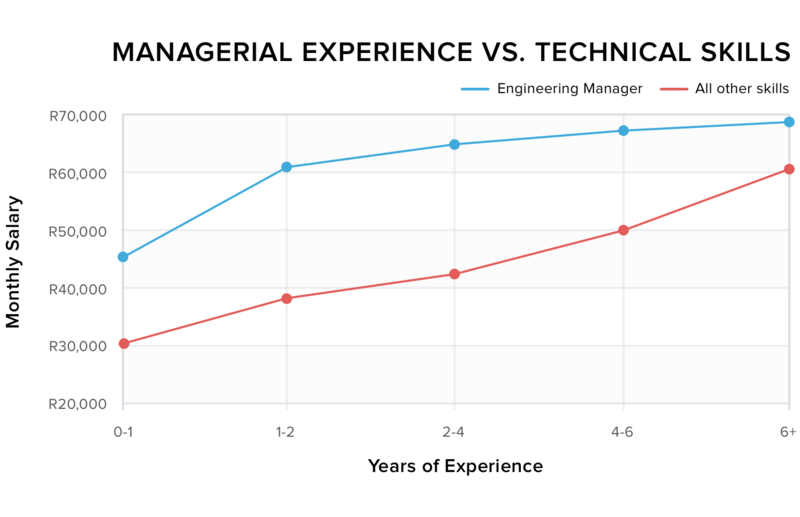 This, however, is not the case for managerial experience, which is almost flat after the first year. 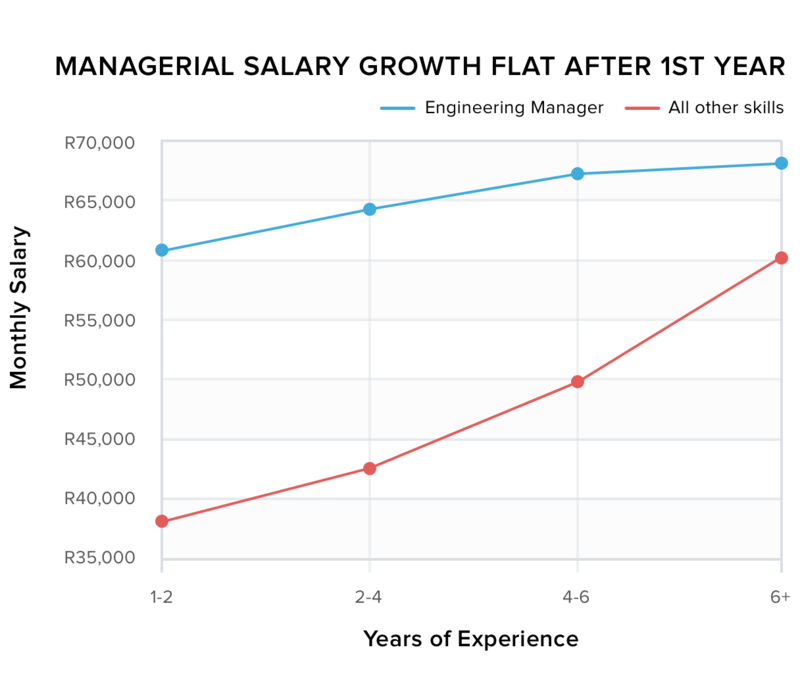 This indicates that a developer gets a salary bump for managerial experience but isn’t rewarded for experience. A logical deduction is that companies see managerial experience as binary, rewarding developers for having been managers before but not for specializing in this discipline. Management experience a proxy for experience? After such a striking conclusion we wanted to stress test our result. Managerial experience is closely coupled with seniority - perhaps instead of analysing managerial experience we were just viewing the premium companies pay for senior developers from a different angle? Could a junior developer expect the same salary premium with managerial experience? Junior developers with 0-1 years overall experience and any managerial experience can earn around R9 500 more than their peers. Intermediate developers with 2-4 years overall experience and some managerial experience can earn 35% more than similar developers without the managerial experience. 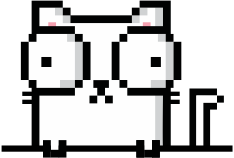 Are you a young developer starting out or a dev manager looking for a pay bump? OfferZen is a job marketplace where top developers are matched with more than 350 of South Africa’s leading technology companies. If you are looking to kickstart your career, click here to sign up to OfferZen. FOOTNOTE: Experience years are on a per job-role basis. Examples of other roles: “front end developer”, “backend developer”, “mobile developer”, “devops”, etc. Each developer can list experience in more than one role and all listed roles were included in this analysis.